FLIR Launches Radar and Thermal Products for Border Patrol and the Dismounted Warfighter | FLIR Systems, Inc.
WILSONVILLE, Ore.--(BUSINESS WIRE)--May 22, 2018-- FLIR Systems, Inc. (NASDAQ: FLIR) today announced the availability of three products for use by global militaries and government agencies including border patrol agents. These products include two FLIR Ranger® mid-range panel radars, one with airborne drone and ground target detection, and the Recon® V UltraLite thermal monocular. The products, unveiled at the Special Operations Forces Industry Conference (SOFIC) 2018 in Tampa, Florida, are part of FLIR’s Soldier Solutions family and demonstrate the company’s commitment to deliver the most advanced equipment to armed services personnel. 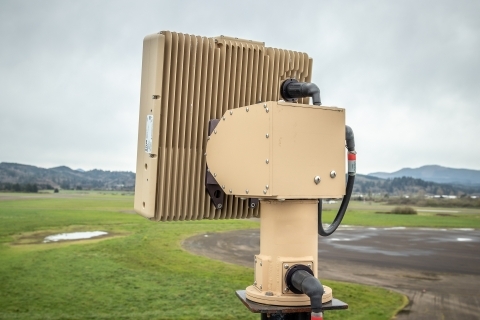 The FLIR Ranger R8SS-3D and R8SS radars, part of FLIR Ranger family of radars, offer mid-range detection capability for both fixed-based installation and forward-deployed operations personnel. The R8SS-3D detects both land and air objects, such as micro-drones, and differentiates birds from drones. The Ranger R8SS-3D reports the altitude and location of small drones at ranges of 2 miles and can also detect vehicles and people walking or crawling. Both the R8SS-3D and the R8SS, the latter of which offers land detection only, can detect over 500 threats and their exact locations simultaneously, and work within an existing data network. The R8SS series mount to either a vehicle, surveillance tower, or tripod, and allows for full 360-degree surveillance, ensuring that threats within surveillance range are detected. These products are sold directly through FLIR and are available today to military and force protection customers and are being shown today at SOFIC booth #726. For more information about the products, visit www.flir.com/surveillance. The statements in this release by Jim Cannon and the other statements in this release regarding anticipated product usage and purpose, are forward-looking statements within the meaning of the Private Securities Litigation Reform Act of 1995. Such statements are based on current expectations and are not guarantees of future performance and involve risks and uncertainties that are difficult to predict. Therefore, actual outcomes and results may differ materially from what is expressed or forecasted in such forward-looking statements due to numerous factors, including the following: the ability to manufacture and deliver the systems referenced in this release, continuing demand for the product referenced in the release, constraints on supplies of critical components, excess or shortage of production capacity, the ability of FLIR to manufacture and ship products in a timely manner, FLIR's continuing compliance with U.S. export control laws and regulations and ability to sell to the U.S. government, and other risks discussed from time to time in FLIR's Securities and Exchange Commission filings and reports. In addition, such statements could be affected by general industry and market conditions and growth rates, and general domestic and international economic conditions. Such forward-looking statements speak only as of the date on which they are made and FLIR does not undertake any obligation to update any forward-looking statement to reflect events or circumstances after the date of this release, or for changes made to this document by wire services or Internet service providers.